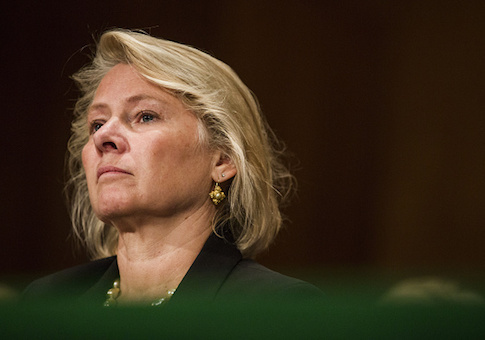 Susan Thornton, who was picked to be assistant secretary of state for East Asian and Pacific affairs, will retire at the end of July after her nomination was bottled up in the Senate since March over concerns she misled senators in testimony during a nomination hearing. "Acting Assistant Secretary of State for East Asian and Pacific Affairs Susan Thornton has announced her intention to retire from the Foreign Service at the end of July," Heather Nauert, State Department spokeswoman, said in a statement. Thornton announced the retirement in an email to staff members on Friday. "As Secretary [of State Mike] Pompeo has stated, he is moving forward with efforts to nominate candidates for leadership roles across the Department, including for this key position," Nauert said. Pompeo told the Washington Free Beacon in an interview last summer that China poses the most serious national security challenge to the United States. Thornton took part in arranging the presidential summit between Trump and North Korean dictator Kim Jong Un in Singapore last month. Thornton came under fire from conservatives for her role as President Barack Obama's assistant secretary of state known for favoring soft line policies toward China. The Trump administration, in a new White House national security strategy, and Pentagon defense strategy, has identified China as a major strategic competitor. President Trump has adopted a number of hardline trade measures against China for its unfair trade practices and theft of American technology. Sen. Marco Rubio (R., Fla.) has been a leading critic of Thornton. "The president should nominate someone who will tenaciously advance America’s interests and values in Asia, and do what is necessary for the United States to prevail in our strategic rivalry with China," Rubio said. Rubio said Thornton, during a February nomination hearing and in written answers to questions, "obfuscated or evaded when answering important questions about her troubling record of undermining America's allies like Taiwan, failing to stand up to China's efforts to impose its authoritarian will beyond its borders, including in the United States, downplaying human rights abuses in China, and favoring smooth relations with Beijing over ‎a bilateral relationship grounded in reciprocity and reality." Thornton was nominated for the assistant secretary post under former Secretary of State Rex Tillerson, who was fired in a tweet by Trump March 13. Pompeo succeeded Tillerson and is more conservative than the former Exxon-Mobile executive. Among those being considered for the State Department is Matt Pottinger, currently the White House National Security Council's Asia policy coordinator. Daniel Blumenthal, a former China specialist at the Pentagon and currently a China expert at the American Enterprise Institute, is also said to be in the running for the post. For the past several decades, key policymaking positions in both government and the intelligence community have been dominated by officials who advocated conciliatory policies toward China. Intelligence on China for years also has been poor and dominated by what critics say is "groupthink" about Chinese intentions that resulted in missed key strategic developments in China. The result has been decades of American policies that did little to confront the rise of the nuclear-armed communist dictatorship in Beijing. Thornton provided confusing answers to senators' questions about her role in a May 2017 incident in New York City when the FBI was blocked by the State Department from arresting several high-ranking Chinese security officials who were in the city in violation of their U.S. visas. The Chinese officials from the Ministry of State Security, the intelligence service, and the Public Security Ministry, which runs the Chinese police, had gone to New York to pressure exiled Chinese billionaire Guo Wengui into returning to China. The FBI had obtained authorization to arrest the officials, but after a video teleconference of administration officials, including several in the State Department's East Asia bureau, the arrests were called off. Thornton was nominated to the State Department post in December. During her nomination hearing before the Senate Foreign Relations Committee, Thornton at first said she was not sure of taking part in the decision-making process to call off the arrests. But when pressed by Rubio, Thornton later said she did not recall whether she was involved in the decision. In later written answers to questions posed by Rubio in April, Thornton stated that she did not take part in the May 26, 2017 conference call about the planned arrests of the Chinese officials because she had been out of the country. State Department officials quickly called for the conference call after learning of the planned FBI arrests. Two of the Chinese officials operating outside their transit visas in New York were identified to the Free Beacon as Sun Lijun, vice minister of the Public Security Ministry, and Liu Yanping, vice minister of State Security. State Department officials feared the arrests of the Chinese officials would have upset U.S.-China relations and thus argued against detaining the officials. Thornton said in her written questions to Rubio that she was unaware of the teleconference. But during the Senate hearing said she was "aware of the conversations that were going on at the time and after the fact." The Chinese officials' covert coercion effort is part of a larger problem of official Chinese government pressure on dissidents. The operations have been called "Operation Foxhunt" by the Chinese and during the Obama administration were carried out without FBI counterintelligence operations against them. The Wall Street Journal reported that State Department officials criticized the FBI for failing to obtain State Department approval before proceeding with the arrests. Rubio also criticized Thornton for her decision to remove the Taiwanese flag from two State Department websites, a move viewed as bowing to Beijing's wishes to play down U.S.-Taiwan relations. Nauert said the department is grateful for Thornton's service as a diplomat for over two and half decades. "We particularly appreciate her dedication to department and interagency colleagues, her extraordinary leadership, especially as acting assistant secretary over the past year and a half, and the personal example she set as an embodiment of the best qualities of a senior foreign service officer," she said. Thornton will remain acting secretary until the end of the month. This entry was posted in National Security and tagged State Department. Bookmark the permalink.